A total of 88 candidates from across Burma, including almost an entire Muslim political party, have been disqualified from the 8 November general election. The 88 were mostly rejected by the Union or regional election commissions for not meeting personal criteria. The highest number of revoked candidacy applications was in Arakan State – some 28 – all of whom were from the minority Rohingya Muslim community. Invariably, those rebuffed did not meet the election commission’s citizenship criteria. “They [Rohingya candidates] failed to meet the qualifications under Electoral Law Article 10(e) – that a candidate must be a Burmese citizen, who is also born to parents who are both Burmese citizens. The rejected candidates did not meet this criteria,” said Aung Kyaw Nyunt, the chairman of Maungdaw District’s election commission. In fact, 17 of 18 candidates were disqualified from one party alone: the Democracy and Human Rights Party (DHRP), based in Rangoon and Maungdaw, which has a high Muslim membership and Rohingya rights agenda. “We [DHRP] received a letter from Maungdaw District Election Commission saying our candidates were rejected after their applications were scrutinised and found not to be in conformity with the laws and bylaws,” said party chairman Kyaw Min. “I wonder if the government is prioritising a policy over the law,” he added. 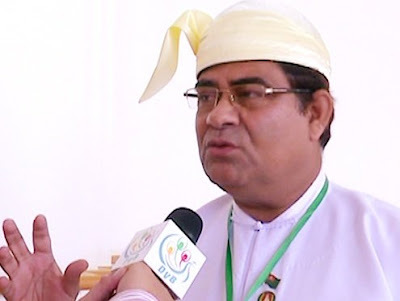 Also among the Rohingya aspirants rejected was incumbent Lower House MP Shwe Maung, a former Union Solidarity and Development Party (USDP) member, who was seeking to run in the polls this time as an independent candidate for Buthidaung Township. He told DVB that his appeal against the district election commission’s rejection was dismissed by the state-level election commission on 1 September. “[Fellow Rohingya candidate] Daw Khin Khin Lwin and I presented our appeals on 27 August and were appointed a hearing on 1 September,” he said. “At 10am, I went to the hearing and presented all my evidence, but the decision must have already been decided, because in less than 10 seconds, [the official] said: ‘U Shwe Maung’s appeal has been dismissed, as has Daw Khin Lwin Lwin’s’. The northern Arakan town of Maungdaw, like nearby Buthidaung, is majority Rohingya Muslim, or “Bengali’ as many Burmese prefer to refer to the community, a largely pejorative term suggesting they are illegal immigrants from neighbouring Bangladesh. Tensions between Arakanese Buddhists and the Rohingya community have boiled over several times in the past, most notably in 2012, when communal violence left over a hundred dead and some 140,000 homeless after mobs sowed destruction among each other’s neighbourhoods. The opposition National League for Democracy (NLD) has reportedly said that seven of its 1,138 proposed candidates have been disqualified for a variety of reasons including ethnicity, age, and association with illegal organisations. An NLD spokesman suggested the party would appeal those cases. The ruling USDP has so far made no announcement about any rejections among its submitted list of 1,139 candidates. UEC Chairman Tin Aye said the rejected candidates have one week starting from 3 September to appeal the decision with their local election commission. If rejected, they may still reach out but not appeal to the regional [state or division] election commission whose decision will be final.